Players fall off the map every year. Some declines we see coming; some we don’t. After being aggressively drafted back in the spring, the following players have all experienced sickening declines in value in the season’s first half. The extent of each player’s depreciation is probably beyond what even the most bearish projections would have imagined. But is the worst behind us? Will life get better in the second half? Let’s take a look to see if we can understand what’s ailing these sudden cases of baseball ineptitude. 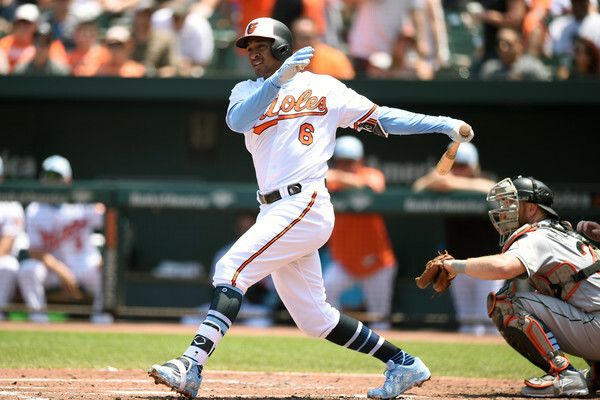 Symptoms: This time last year, Schoop was celebrating his first All-Star Game appearance, earned by a first half where he hit .295/.347/.536 with 18 home runs and 54 RBI. After compiling 32 homers and over 100 RBI last season, I confidently ranked the 26-year-old as the fourth-best second baseman (after Jose Altuve, Jose Ramirez and Brian Dozier). This year? Schoop has posted a .216/.256/.381 slash while hitting only 10 homers and 23 RBI. His .165 Isolated Power is the lowest it has been since 2014. He is also one of fifteen Orioles currently posting a negative WAR. In short: Schoop’s 2018 has been a total barf-fest. Outlook: The good news is that a semblance of hope exists for Schoop’s short-term recovery. His .240 BABIP is .056 points below his career average. Likewise, his current ISO is .020 points below his career .185 mark. Even on a horrendous team, one can assume that with some good luck and a bit more power, a quick turn around could help salvage some value from a mostly lost season. My long-term prognosis for Schoop is much more pessimistic, as I’m getting a very Rougned Odor feel from Schoop. They share a position, sure, but their power and BB/K parallels are both pretty well aligned as well. And not in a good way. I don’t know where I’ll rank Schoop next season, but it sure as hell won’t be fourth. It might not even be fourteenth. Symptoms: Jon Gray is defying our understanding of a strikeout’s value. Out of 83 qualified starters, Gray currently ranks fourth in xFIP and eleventh in SIERA. Against the same crowd, Gray also ranks third-worst in ERA with a pus-filled 5.77. How can this happen to a guy striking out over four batters for every issued walk? His sparkling SIERA and xFIP numbers, when compared to his nasty ERA, would generally lead one to believe that he has been sabotaged by awful luck, nonexistent team defense, or a ceaseless homer barrage. But right now it sounds like something different. Something mental. Something that Gray needs to “work out.” As a result, Gray is in Albuquerque working to dispel his mental hang-ups. How long? Only the Rockies’ front-office really knows, and we all know what that means. Outlook: I like Gray to reassert himself into dynasty owner’s hearts sometime in the not-too-distant future. A pitcher this talented is extremely hard to break, and I’m confident that even the Rockies aren’t dumb enough to mess him up entirely. The unhittable stuff is there, the control is good enough, and he has a decent defense behind him. Should dynasty owners count on him being a No. 2 or even No. 3 starter down the stretch? No. But if Gray gets rid of what’s ruining his season down on the farm, he is a dynamic arm who will immediately provide ace-esque Ks with playable ratios to boot. Hold tight until then. Hi Jonathan. Kingery. Anyone in the top 150 today that has a similar profile? example…a good season or half season that is an outlier on the positive side that is swaying public sentiment? the helium is just too much? Cavan Biggio is a big one. He has really exploded and, as a result, has taken some people by surprise. I’m not going to bank on him even though I added him in a few leagues. Right now I’m doing everything I can do unload before he comes back to earth, or gets exposed at a higher level. Great article, always enjoy reading this kind of stuff. Perhaps a silly compliment, but can I just applaud you for using the expression “.25 BB/K”? It’s easy to read as a 1:4 ratio, if one knows their decimals and fractions. I don’t know why other sites feel the need to say something like “14/35 BB/K” when they could at least knock it down to “2/5”, it not “.4”. Mathematical laziness, I guess.